The storm that became known as Hurricane Katrina formed over the Bahamas on 23 August 2005. It became a Category 1 hurricane (winds of 74–95 miles per hour) two days later and crossed southern Florida. Over the warm waters in the Gulf of Mexico, the storm strengthened, packing 175 mile-per-hour winds that made it a Category 5 hurricane—the strongest possible. Moving north through the Gulf of Mexico, the 450-foot-wide storm made landfall 40 miles east of New Orleans, coming ashore early on 29 August over Southeast Louisiana and into Mississippi as a Category 3 storm (111–130 miles per hour). Its powerful right-front quadrant passed over coastal and central Mississippi, causing a twenty- to thirty-foot tidal surge and fifty-five-foot sea waves. Moving north, the storm drenched most of the state, with rainfall totaling between eight and ten inches. Hurricane-force winds battered Mississippi for seventeen hours, spawning at least eleven tornadoes along the Gulf Coast. Winds measuring 80–85 miles per hour were recorded as far north as Jackson, approximately 150 miles from the coast. The hurricane did not downgrade to a tropical storm until it crossed out of Mississippi and into Tennessee, where it finally dissipated on 30 August. Katrina was one of the five most deadly hurricanes in US history, with 1,836 people killed in the storm itself and the subsequent floods. It was also the most costly hurricane ever to hit the United States, causing an estimated $125 billion in damage. Katrina leveled 65,380 homes on the coast and washed away city after city—antebellum houses, businesses, schools, hotels, marinas—from Pascagoula to Bay St. Louis. Flooding reached as far as twelve miles inland. One third of the state’s population—approximately 800,000 people—remained without power for days following the storm. Across Mississippi, 238 residents lost their lives. In the few days before Katrina made landfall, the National Hurricane Center warned residents of the impending storm. On 26 August Mississippi activated its National Guard, and by 29 August, forty-one counties and sixty-one cities had issued evacuation orders, with fifty-seven emergency shelters opening along the coast and thirty-one in reserve if needed later. More than one million people left the storm’s path. All of Mississippi’s eighty-two counties were affected by the storm, and forty-seven were declared full disaster areas. However, the state’s three coastal counties—Harrison, Jackson, and Hancock—suffered the most damage. Hancock’s cities of Waveland, Bay St. Louis, Pearlington, and Clermont Harbor were almost completely destroyed as water took out every structure within half a mile of the beach. Fifty-one deaths were recorded in the county. The death toll was highest to the east, in Harrison County, where 126 people were killed. 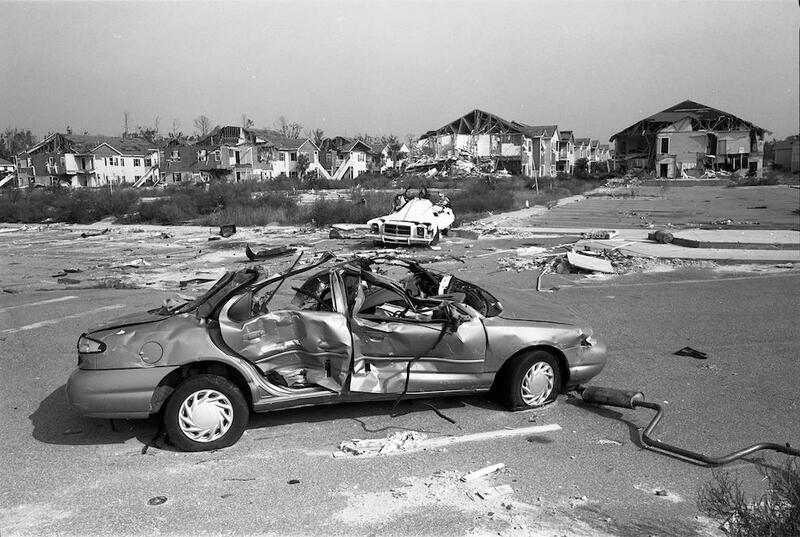 The cities of Long Beach and Pass Christian were flattened, while Gulfport and Biloxi suffered extensive damage. The Biloxi–Ocean Springs Bridge was obliterated. Biloxi’s nine casino-hotels were destroyed, with several of the barges on which they sat washed onto land. In 2003 the casinos generated $879 million in revenue and were the second-largest employer along the Coast. After Katrina, their loss meant that unemployment skyrocketed. In addition, the seafood industry, primarily shrimp processing, had employed about three thousand people and accounted for $450 million per year but was decimated by the hurricane. . The county also suffered from the flooding of Biloxi’s Keesler Air Force Base and from shipping disruptions at the Mississippi State Port Authority in Gulfport, the third-busiest US container port on the Gulf. The casino and shipping industries and the military presence helped Harrison County recover in the years following Katrina. Jackson County also experienced the tremendous storm surge, with 90 percent of the city of Pascagoula flooded and twelve people killed. Other communities in the county suffered extensive damage, as did Ingalls Shipbuilding. In the wake of Hurricane Katrina, volunteers from around the world came to help Mississippi recover. Nongovernmental organizations such as the American Red Cross, Americorps, North Carolina Baptist Men, the Salvation Army, Catholic Charities, and hundreds of individuals arrived within days of the storm. Just two weeks after the hurricane made landfall, corporate relief donations reached approximately $409 million. Officials from national organizations and the Mississippi Commission for Volunteer Service estimate that more than two hundred organizations with more than eight hundred thousand volunteers provided relief to Mississippi through more than eighteen million hours of work.